In this modern age, online shopping is increasingly popular. There are loads of reasons for this. Convenience is one, browsing online stores, you can quickly make a purchase without having to face the crowds in your local shopping mall. Online shopping can also be cheaper, with Amazon and eBay sellers offering you unbelievable bargains on the latest products. However, online shopping isn’t everything! 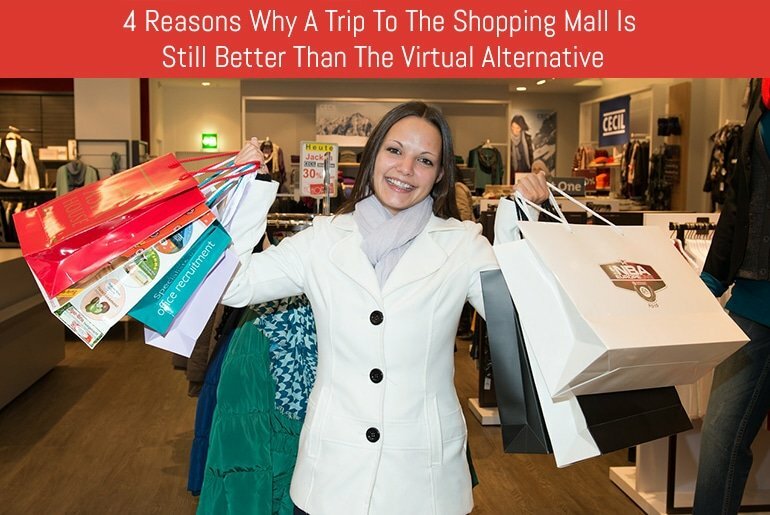 Despite the advantages, there are still reasons why heading to your local shopping mall is still better than the virtual experience. Consider the following for example. No matter how flashy the website you visit, there are some experiences that can only be found on your high street and shopping mall. Heading to the store with your friends, you can have a lot of fun trying on clothes, showing off to each other, and having a laugh, even if you don’t end up purchasing something. Big name stores try to win you in as well, with extravagant window displays, pumping music, and even animatronic dinosaurs. Then there are the outdoor markets, with tempting foods and bargain goods. The sights, the sounds, the smells, the banter, and the camaraderie of offline shopping is something those online sellers will always find difficult to replicate. It’s difficult to find somebody to talk to when you visit an online store. If they don’t have a ‘live chat’ option, you may have to wait days before somebody finally gets round to replying to your message. Not so in your regular bricks and mortar store. Got a question? There will always be somebody to speak to. Need a personal recommendation? A human being is better than an online bot, every time! Yes, you can make an immediate purchase online, but you still need to wait a week (or more) before the product is actually yours to keep. Not so in your local store. An immediate purchase is exactly that. You can walk away with whatever you have bought, and use it on that very same day. Need something in a hurry? The online store just won’t do. The only waiting time you have to endure is the queue at the shopping counter. See something you like online? Fine, but you can’t touch it, smell it, or taste it. An offline store is different. See a dress you like? You can try it on in store, and actually experience how good it feels, as well as knowing if it fits or not. The sales assistant will give you advice, as well. Buying a dress online? Despite the measurements on screen, you can never be certain if it will really fit (or feel good) until it arrives at your door. You are less likely to make a buying mistake in your store, and you won’t have to go through that pesky returns process should you (or the seller) make a blunder. So, don’t ditch your local stores just yet. There are reasons why online retailers will always struggle to match their offline counterparts, though you can, of course, take advantage of both. As the consumer, you have the choice, but we hope we have convinced you to put down your smartphone for just a moment and consider why a trip to your local shopping mall may be just what you need.